Omaha Atheists to Rally Because “Minorities Matter”. If you are in the Omaha Metro, be sure to show up this evening in La Vista and tell their Mayor that ALL minorities matter! OMAHA, NE – Recently, a concerned Omaha Atheist expressed his concerns to a Nebraska Mayor about the presence of religion in a city sponsored event. 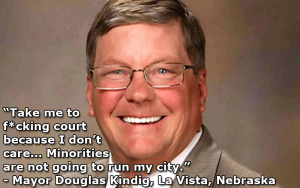 The Mayor responded with some Nebraska Nasty by saying, “Take me to f*cking court, because I don’t care… Minorities are not going to run my city.” According to KETV, Mitch Beaumont, La Vista community relations coordinator, released the following statement on Kindig’s behalf Monday: “I am truly sorry that my response to this representative caused backlash against the City. I was coming out of a very emotional event at which local veterans who were killed in action were recognized, and my reaction was certainly emotional in nature. It is my hope all sides can move forward together,” said Kindig.